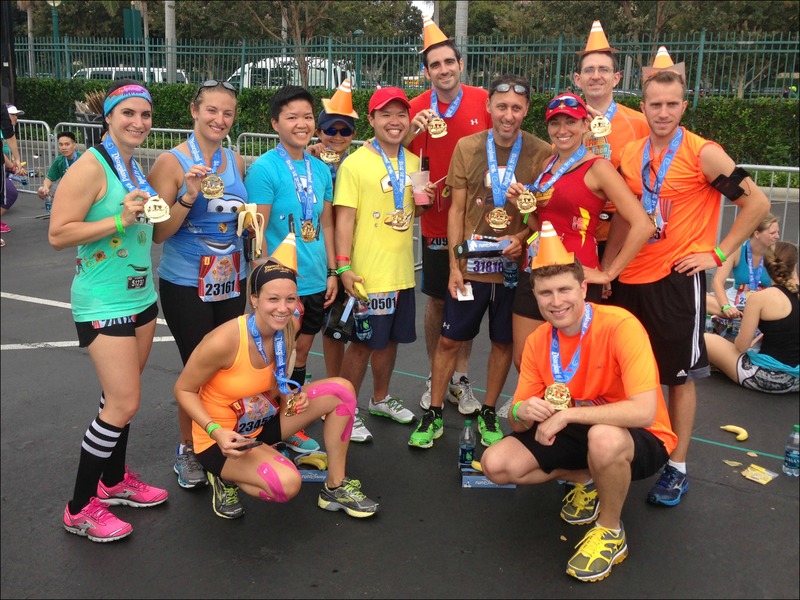 Ok, one last Disneyland Half Marathon related post – since a few people asked I thought I would share some information on where our fun Cars shirts that we wore for the Disneyland 10k came from! 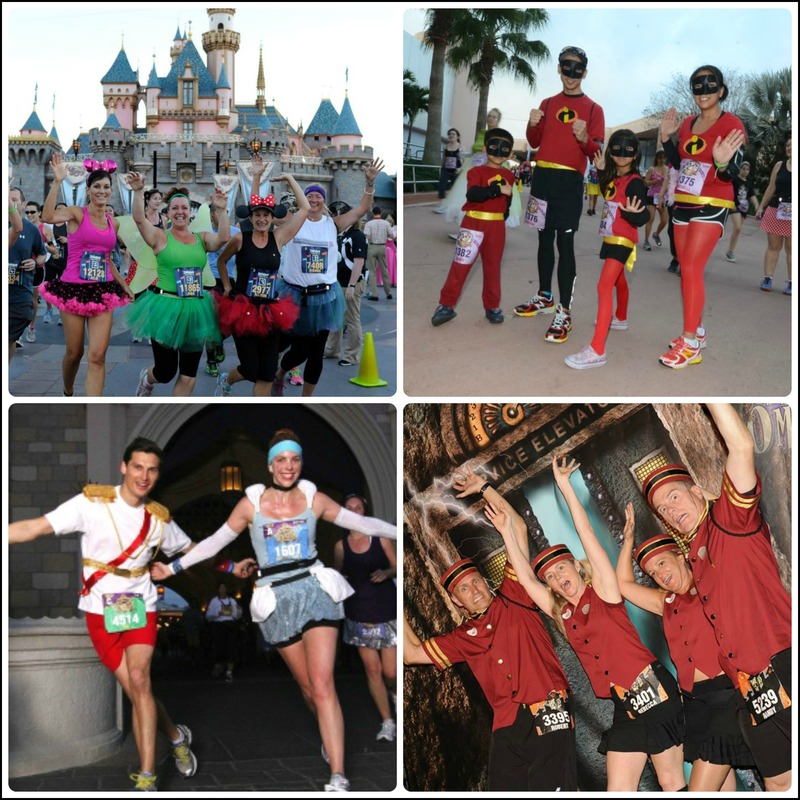 One of my favorite things about the runDisney races is seeing all the runners in their fun and creative costumes! Pre-Race: This costume is so cool and I look awesome! Why haven’t I done this before?!! Mile 2: This really isn’t bad, I should run EVERY race in a costume! Mile 6: Ok, this is starting to get a little warm and uncomfortable…. Mile 8: What the hell was I thinking running in a costume!? What sane person does this?!? Mile 10: I’m hot. I’m tired. My legs hurt and I am going to LOSE IT if I don’t get this ridiculous thing off of me right now! Miles 11-13 would be irrelevant because I would have already peeled off the costume and resumed running in whatever I had on underneath. So yes, I put a lot of thought into this and decided costume + running = cranky Danielle (which is something we try very hard to avoid!). This summer with the Dumbo Double Dare approaching I began to think that maybe the 10k was the right time to try a (very minimal, running clothes based) costume of sorts (notice how in the above internal monologue the crankiness doesn’t begin to set in until after mile 6, the 10k would be the perfect distance!). THE STORY OF THE CARS COSTUMES! It was perfect! Now my only problem was to figure out how to dress two adults up as cars (and make it comfortable enough to run 6.2 miles in). Meet Zach. 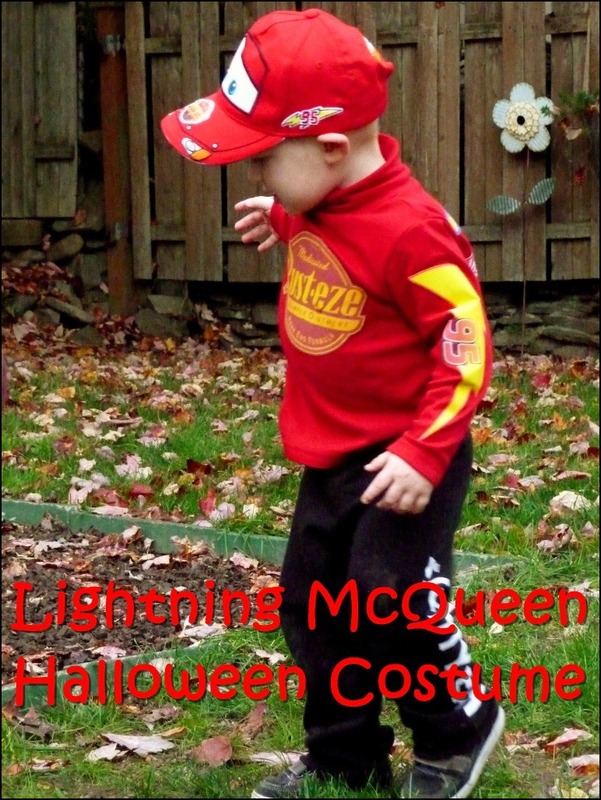 Zach’s picture led me to his mom’s blog, Lily & Frog, which had step by step directions on how to create this adorable (and unintentionally running friendly) Lightning McQueen costume! I e-mailed Beth my request (knowing full well a request for adult sized, running friendly, Cars character shirts would most likely sound crazy to someone not familiar with runDisney) and fortunately she quickly replied that she loved the idea and it was totally do-able! I shared the fun news with my Disney running friends, who quickly decided they too wanted to race as Cars, so Sally, Guido, Luigi and Filmore were quickly added to the order! We decided the best thing to do was for me to choose & order the blank shirts and send them to Beth to design. 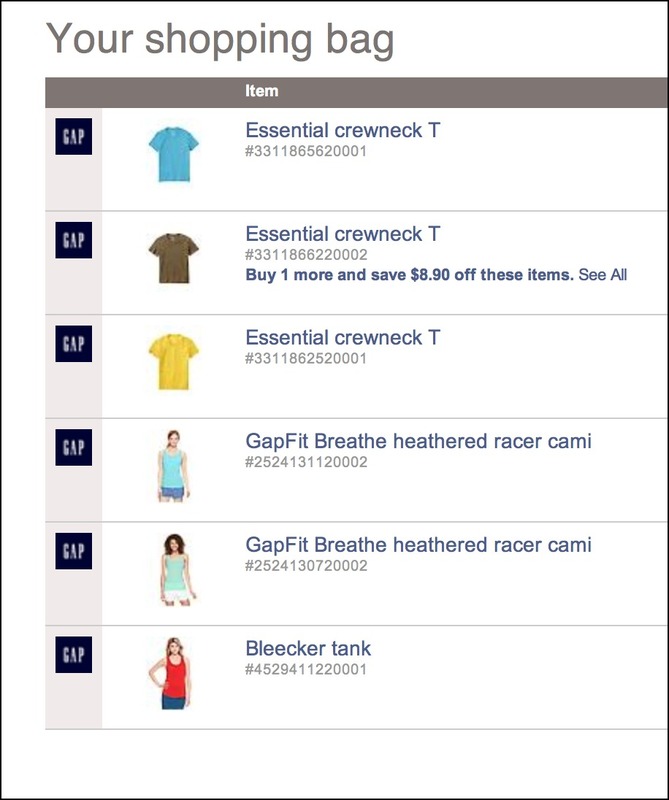 Fortunately I was able to find all the colors we needed at Gap and I had them sent directly to her house! From there, Beth and her research assistant Zach got to work…(from what I hear Zach worked hard watching Cars several times to make sure they got the details just right! 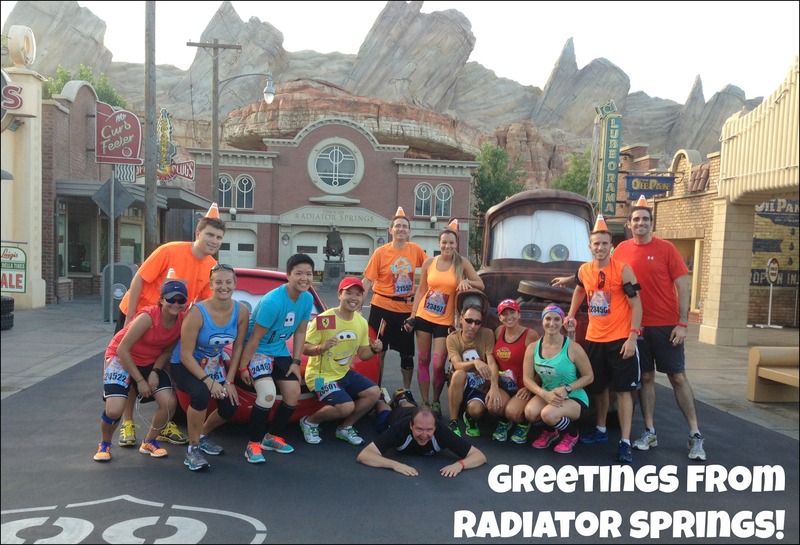 )…and a couple of weeks later, the residents of Radiator Springs arrived at my front door! Tip: I would suggest NOT using a fitted shirt for these, even though the shirt fabric stretches the iron on design does not stretch well and may cause it to peel off. My shirt was the only one that was really fitted and had this problem so I bought some fabric glue for touch ups – next time I’d get a bigger shirt though to avoid the problem! 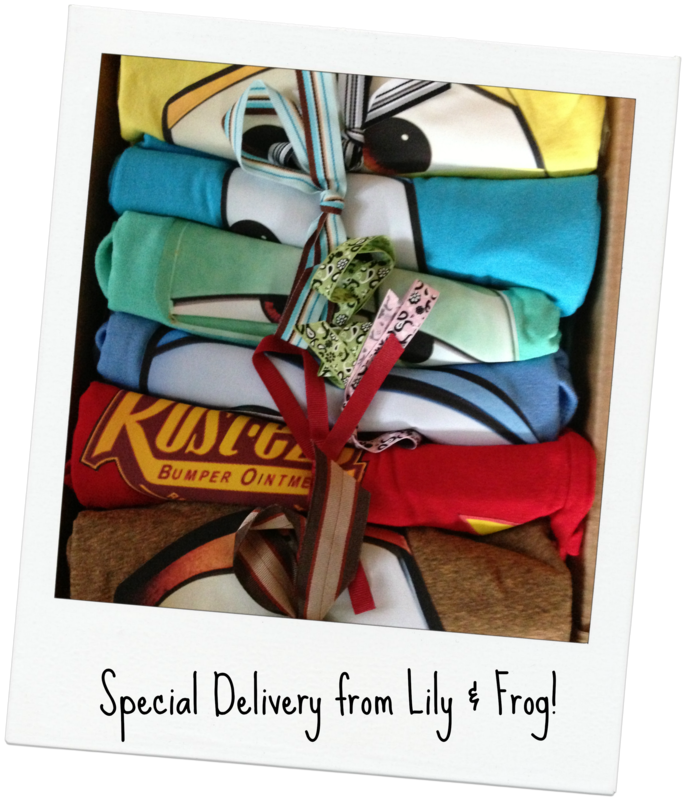 Disclaimer: I have not received any sort of compensation from Lily & Frog for this post, I found Beth on my own through internet searches and I just wanted to share her info since the shirts came out great and working with her (and Zach!) was such a great experience! I can’t recommend her enough if you’re interested in costumes for a race or anything else! 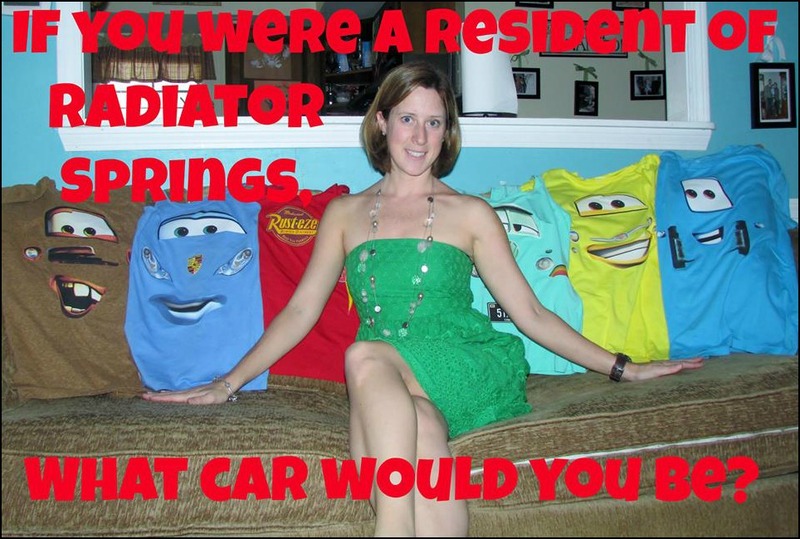 So, which car would you be?? Thank you again to Beth and Zach!! I still laugh thinking about us all running together. It was perfect! I’m still loving this idea, it’s great! I would’ve loved to have seen the whole group, Cars and Cones, running around Carsland. I’m also the same way with costumes. I want running gear if I’m running anything longer than a 5k. Halloween is my favorite holiday and I love having an excuse to dress up, so it’s perfect for me- and I love trying to be as creative as possible when trying to make the costume out of tech material- bc I agree, we try to avoid cranky Abby at all costs! But the Cars theme was genius and well done! I will definitely be looking into Beth’s skills for future events. Were the Gap Tees tech as well? The Gap shirts actually weren’t tech, we figured for just a 10k we could live with cotton since they were so much less expensive (they were all on sale for $8-12), plus we weren’t expecting California to be so humid! What a great idea! I was wondering where you guys got those shirts. So many amazingly crafty people on Etsy. Thanks for including my Cinderella & Prince Charming pic, btw! Thanks! Glad you don’t mind that I used that pic – I actually meant to tweet you and ask if it was ok and I totally forgot! Sorry! So cool about the shirts! I was wondering where you guys got those! And I’m impressed with those people who ran with a cone on their head!! Haha, some of the things people run in are crazy! Thank you Danielle, it was a pleasure working with you… Your pictures are wonderful and ya’ll looked like you had a great time! Zach LOVES seeing himself on your webpage (because it isn’t his Mom’s, of course, Mom is Sooo not cool any more, lol). Can’t wait to see your plan for next year! Haha, I’m so glad to hear Zach enjoyed it! We’re already brainstorming for next race! Oh my… I was just thinking, you could do Alice in Wonderland. I designed an adorable Alice inspired tutu for Lily’s 2nd birthday… They can come in an adult size. You just need to convince someone to dress as the White Rabbit, Mad Hatter and in a giant caterpillar costume, lol! We have an idea in mind for next time, I’ll message it to you – want to keep it a secret! Ohhhh… Can’t wait to hear about your next race! I had no idea about this race until you… And I’m so happy to have learned about it! You guys looked great in those outfits. Hope you will try a costume again, but I agree, it has to be runner friendly! Thanks Pam! Can’t wait to see what you guys are cooking up for Wine & Dine and Dopey! Haha, I love Guido & Luigi, they totally crack me up! The Guido “Pit Stop” pictures from the 10 is one of my favorites. your costumes were so creative!!! how on earth did the cones stay on their heads? The cone hats were like kids party hats, they had the elastic that went under their chin! Your costumes were awesome!! Beth did a great job – I wish I was more crafty but I’m just glad there are people like Beth who really are crafty!! Haha same here, I can come up with the ideas, I just can’t actually execute them!